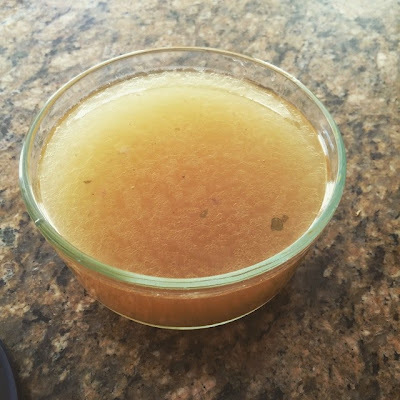 Homemade Stock - San Diego Dining Dish! The source of all great cooking is great ingredients, the most basic that most of us miss is stock. For years I used the little cubes because stock was always so expensive in the store and making it would be a hassle. It turns out that it is quite simple and uses things you normally throw away. Basically, if you can boil water, you can make stock. I try to keep homemade stock on hand at all times. It's a magnificent tool to create amazing soups out of vegetables and various dried or canned beans, lentils and other legumes in the cupboard, or to add with some salt, flour, and seasonings to create a gravy or sauce. To store it, I simply pour it into numerous Pyrex containers, and throw them into the freezer. I find messing with the freezer bags to be messy, and Pyrex makes all of those different sizes so that you can store stock a cup at a time, or up to an entire quart. I store my frozen stock in various sizes to simplify its use in various recipes. I always make vegetable or chicken stock -- depending upon whether I have a chicken carcass leftover from a chicken. So if I make a roasted chicken, I always save the back and the carcass to throw into the stock pot with vegetable leftovers (I'll get to that later), add water to the entire thing, throw in 1/8 cup of salt, and allow to simmer for a few hours, until it is slightly thickened, and the color is a nice beautiful yellow. Vegetable stock is made when my supply of frozen vegetable bits gets out of control, and my stores are running low. A few years ago, I realized that I was throwing out a lot of vegetable bits that were perfectly usable in stock, such as carrot peelings, tops from onions, edamame shells, celery ends, etc. I simply toss them into a plastic shopping bag, tie it off, and throw it into the freezer. When the bag is full, I know that it's time to dump the contents into a stock pot, with or without a chicken carcass, and make stock in the same manner described for chicken stock. When the stock is a nice honey orange color, the stock is ready (my family eats a lot of carrots). Basically in my household stock is used in the place of water for most dinner and lunch recipes, so if you get chance take leap and try it. Let me know how it works for you, and trust me you will not be disappointed!